If objects or loads are not secured when being transported in the through-loading facility, they could slip or be thrown around and thereby hit vehicle occupants. Observe the loading guidelines and the safety notes regarding stowage spaces . The through-loading facility is opened from the cargo compartment. 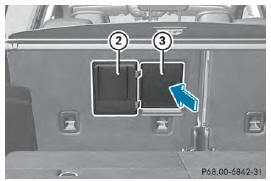 ■ Release the seat backrests in the second row of seats and tilt them in the cargo/load position . ■ Fold down the rear seat armrest. ■ Pull the center head restraint on the rear bench seat into the uppermost position . ■ Slide release catch 1 to the left and swing flap 2 to the left until it is lying on the rear side of the rear bench seat. 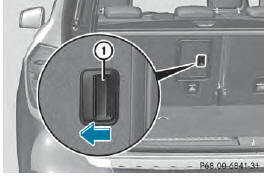 ■ Push cover 3 forward until it is lying on the rear seat armrest.